M P E 110 (1968) The diesel screw M P E 110 foundered April 12, 1968 off of Cook Inlet. The Macray was valued at $25,000 at the time of the loss and had no cargo or insurance. Nothing is mentioned in the wreck report about the scow that was cut loose or whether it was carrying any cargo. 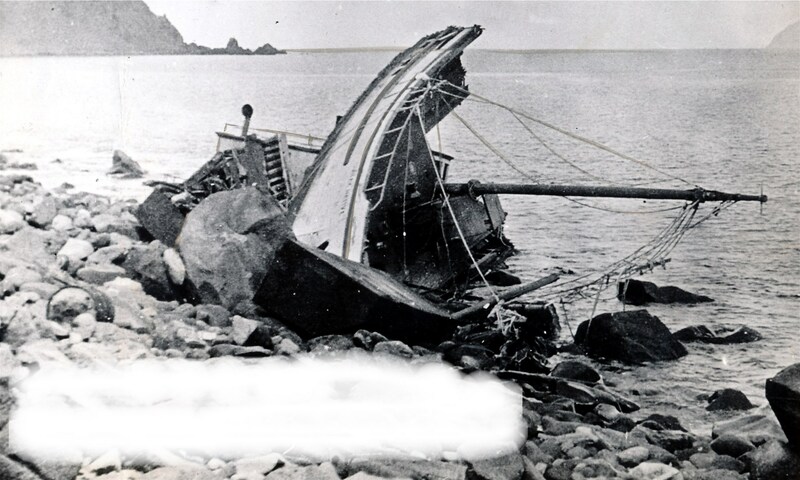 MADRE DOLOROSA (1966) The crab fishing vessel Madre Dolorosa swamped, capsized and foundered August 14, 1966 off of Karluk. Five persons were lost including skipper and owner Donald B Vinson, his sons Boyd and William Vinson, James White and Ronald Winberg. MAGGIE (1953) The 12 ton 30 foot wooden gas screw fishing vessel Maggie burned May 26, 1953 near Anchor Point in Cook Inlet. MAGNET (1980) The 36 foot vessel Magnet sank September 20, 1980 in the Spiridon Bay area. MAGNUM (2007) The 56 foot salmon seiner Magnum foundered June 23, 2007 near Cape Igvak on the Alaska Peninsula. At 22:45 the vessel began flooding from the aft steering compartment prompting those on board to don survival suits and abandon ship to the life raft at 23:00. The Magnum sank within 15 minutes. The crew of four family members was picked up by the vessel Sea Storm three days later about 17 miles west of Halibut Bay in the Shelikof Strait. MAHINA HOU (1950) The 162 ton 103 foot steel oil screw fishing vessel Mahina Hou stranded and was lost August 24, 1950 in the first cliff west of Cape Suckling. MAIA D (1994) The 34 foot salmon troller Maia D got line in her screw, flooded and sank May 16, 1994 in Stevenson Entrance. Both crewmembers were rescued by the U S Coast Guard. MAJESTIC (1956) The 104 ton 74 foot wooden oil screw fishing vessel Majestic stranded and was lost August 12, 1956, 12 miles out of Puale Bay in the Shelikof Strait. MAJOR (1976) The 50 ton 54 foot wooden oil screw fishing vessel Major foundered August 12, 1976 off of Kodiak Island. MAKO (1958) The 9 ton 30 foot wooden gas screw fishing vessel Mako was consumed by fire May 31, 1958 at the mouth of the Kasilof River. MALINA (1961) The 165 ton 82 foot wooden oil screw fishing vessel Malina stranded and was lost June 14, 1961 near the Black Hills In Bristol Bay. MALOLO (1991) The 58 foot wooden tug Malolo experienced an electrical malfunction during heavy weather in Cook Inlet causing an inability to pump bilges and subsequently sank December 21, 1991 near the southwest end of the Kenai Peninsula. MANHATTAN (1917) The 129 foot steel hulled halibut steamer Mahhattan struck an uncharted rock off Lituya Bay and was lost at 2:00 a.m. Thursday November 15, 1917. The Manhattan departed Vancouver, B.C. October 29, 1917 on a fishing venture with 34 crewmen aboard. The vessel came across the stranded and abandoned wreck of the Al-Ki on November 1st near Point Augusta. The crew looted the vessel, taking whatever they could find of value. They then proceeded to the halibut fishing grounds of the Gulf of Alaska. By the time of the disaster, they had caught 80,000 lbs. of fresh fish worth $12,000. While heading to Cape Spencer with their newly caught load of halibut, John Kolseth of Vancouver, master of the Manhattan, lost his bearings in a gale and thick snowstorm and stranded the Manhattan off Lituya Bay. The crew abandoned ship in dories but were unable to land because of an enraged brown bear that pursued them through the surf. Thirty hours after the stranding they spotted the Mariposa passing and managed to attract their attention by burning an oilskin coat. They were rescued and taken to Juneau where they were promptly arrested for looting the Al-ki. The Mariposa had been the vessel that had rescued the crew of the Al-ki as well as those of the Manhattan. When the crew of the Mariposa heard that the crew of the Manhattan had looted the Al-Ki they radioed ahead to the authorities. Charges against the crew of the Manhattan were soon dropped as all of the evidence had gone down with the Manhattan somewhere near Lituya Bay. MANZANITA (1975) The 78 ton 76 foot wooden oil screw Manzanita foundered April 17, 1975 near Cordova in the Gulf of Alaska. MAPELE (1943) The 3,545 ton steam screw freighter Mapele grounded and was lost January 15, 1943 at Cape Devine in the Shumagin Islands. One crewmember and one Armed Guard were lost in the surf during rescue. 48 others were taken aboard the USS Discoverer. MAR DEL LABRADOR (1984) The 200 foot stern trawler Mar del Labrador sank November 2, 1984 approximately 25 miles southwest of Kodiak. The Mar del Labrador sailed out of Vigo, Spain and carried two American and 28 Spanish crewmembers. All thirty were picked up by the fishing vessel Dona Genoveva and transported to Kodiak. From the time the vessel distress call was received at 5:30 a.m., when she was reported taking on water in the engine room, until the Mar del Labrador sank was only a matter of minutes. MAR DEL ORO (1976) The 156 ton 80 foot steel oil screw shrimper Mar del Oro foundered in the Shelikof Strait October 14, 1976. The vessel sank within minutes. The 6 person crew escaped to a life raft and all were hoisted to a Coast Guard helicopter two hours later. MAR DEL PLATA (1977) The 156 ton 80 foot steel oil screw shrimp fishing vessel Mar del Plata grounded and foundered May 19, 1977 in the Shelikof Strait. Crewmen were rescued by the fishing vessel Heidi J.
MARATHON (1925) The 25 ton gas screw Marathon drug anchor and stranded in Kodiak at 11 a.m. November 17, 1925. The vessel was moored in the harbor until a 45 mile an hour SW gale forced her onto the beach “about 500 feet west of Erskine’s Dock”. The two aboard the Marathon attempted to get an anchor out but were too late. The Ga. S. Pronto also attempted to render assistance but the Marathon had drifted onto the reef. The engine of the Marathon was salvaged but the hull was damaged beyond repair. The Marathon was valued at $2,500 and had no insurance. MARCONIA (1962) The 115 ton 74 foot wooden oil screw halibut fishing vessel Marconia struck a submerged reef and sank in Unga Strait on March 25, 1962. All 10 members of the crew abandoned ship to a life raft and paddled to a nearby sand spit where they were rescued. MARDI SUE LYNN (1990) The 35 foot aluminum crab fishing vessel Mardi Sue Lynn caught fire and burned to the waterline April 25, 1990 off of Cape Chiniak. All three crewmembers abandoned the vessel in a Zodiac. MARGARET (1921) An explosion and fire destroyed the 55 ton gas screw Margaret at the oil dock at Katalla at 9:30 a.m. Wednesday July 6, 1921. The three crewmen aboard all suffered burns but survived the disaster. The Margaret was being filled with “distillate oil” at the time, having loaded seven tons or $500 worth. The crew had loaded oil many times before and could find to cause for the explosion. About a dozen company men helped fight the blaze, but the Margaret became a total loss. She was valued at $42,385 and had $25,000 worth of insurance. MARGERY (1905) The 10 ton 35 foot wooden schooner Margery was washed ashore in a westerly gale on the east side of Sanborn Harbor at 3 a.m. November 7, 1905. The vessel departed Sand Point the day before bound for Sanborn Harbor with two aboard. They had two anchors with 30 and 45 fathoms of chain out, but the chains parted in the heavy westerly gale. Both crewmen survived, but the Margery, valued at $400 was a total loss and had no insurance. MARGUERITE (1936) The 19 ton gas screw Marguerite exploded and caught fire at 5:30 p.m. Wednesday July 8, 1936 while docked at Snug Harbor. The three crewmen escaped but the Marguerite was cut adrift and sank. She was valued at $2,000 and was a total loss with no insurance. MARGUERITE (1964) A vessel named Marguerite owned by Neal Day was reported lost at Kodiak in the Good Friday earthquake of March 27, 1964. MARI JANA (1985) The fishing vessel Mari Jana took a wave over the stern, flooded and sank July 26, 1985 six miles off of the mouth of the Kenai River in Cook Inlet. MARIA (1965) The 8 ton 28 foot wooden gas screw fishing vessel Maria was consumed by fire August 25, 1965 at Naknek. MARIE JO (1942) The 28 ton 44 foot wooden oil screw fishing vessel Marie Jo foundered August 11, 1942 in Mill Bay. MARIE MAE (1989) The 32 foot aluminum salmon fishing vessel Marie Mae rolled quickly, capsized and was lost July 5, 1989 three nautical miles off of Ninilchik in Cook Inlet. The two crewmembers narrowly escaped to safety. MARIE N (1964) The 10 ton 38 foot wooden oil screw pleasure vessel Marie N stranded and was lost (tidal wave) March 27, 1964 at Kodiak. MARINE MAID (1988) The 32 foot gillnet fishing vessel Marine Maid sank July 4, 1988 off of Ninilchik. The report lists the vessel and cargo as total losses. The Marion was valued at $8,000 and insured for $6,000. Her cargo was insured for $4,400. The crew survived through great hardship on a small island near the disaster. They were rescued by the steamer Dora and taken to Valdez. Three men died attempting to salvage some of the stores on the Marion several months after she was lost. MARION (1952) The 14 ton 49 foot wooden gas screw fishing vessel Marion burned May 11, 1952 about three miles west of the mouth of the Kaliakh River. MARION A (1978) The 42 foot steel crab fishing vessel Marion A rolled over an sank in foul weather in Geese Channel off of Aiaktalik Island October 2, 1978. Crewmen Jerry Allain (28) and Delno Oldham (25) were lost with the Marion A. Both were from Kodiak. A third crewman, Gerald C. Bourgeois (29) of Covington, Louisiana was rescued 11 days later by the vessel Moonsong. The Marion A listed to port and capsized at 10:30 in the morning a half mile from Aiaktalik Island on October 2nd. It happened so quickly a radio distress call could not be made. With the help of skipper Allain, Bourgeois was able to wrestle into a survival suit while in the water. The two attempted to make shore but Allain succumbed to the cold before they reached the beach. Bourgeois got to shore after a long struggle and put together a makeshift shelter of driftwood. He stayed in the survival suit the entire 11 days until rescued, living on beach grass, wild celery and mussels. No one in the fleet knew that the Marion A had been lost. On Friday the 13th crewman Buddy Walton from the fishing vessel Moonsong happened to be looking through binoculars as the vessel passed the beach where Bourgeois was shipwrecked. He noticed the orange of the survival suit and passed the glasses to skipper Ole Harder who identified the orange object as having waving arms. Realizing he was about to be rescued, Bourgeois could not wait for a skiff to be launched and swam out to the Moonsong. MARJORIE H (1971) The 40 ton 50 foot wooden oil screw halibut fishing vessel Marjorie H foundered May 20, 1971 off of the Kenai Peninsula 80 miles west of Resurrection Bay. The vessel was reported to have struck a deadhead. The five crewmen spent two days in a life raft before they were picked up by another fishing vessel. MARK F (1974) The logging barge Mark F foundered September 3, 1974 near Whittier. The vessel became disabled in high winds and her cargo of logs broke loose causing the Mark F to founder. MARLEE (1978) The 33 foot wooden gillnet fishing vessel Marlee disappeared some time after May 8, 1978 along with her 76 year old owner George Elias Parr. Parr made purchases in Seward and was issued an Interim Use Permit for the halibut season that opened May 11, 1978. He and the Marlee were never seen again. A missing person report was filed with the Alaska State Troopers in September of 1978 and coastal search initiated in October of 1978. No sign of Parr or his vessel have ever been found. The Marmot was valued at $18,000 at the time of the disaster. Her cargo of 30,000 lbs. of freshly caught halibut was valued at $2,000. Both the vessel and her cargo were total losses. The Marmot was insured for $16,000 and her cargo insured for $2,000. MARMOT CAPE (1964) The vessel Marmot Cape, out of Port Bailey and owned by Herman Von Scheele, was reported missing in the Good Friday earthquake of March 27, 1964. MARMOT CAPE (1977) The 27 ton 40 foot wooden oil screw fishing vessel Marmot Cape foundered October 15, 1977 in Astrolabe Bay 14 miles west of Cape Spencer. While headed south from Alaska to Columbia Ward in Seattle, the vessel sought shelter in Astrolabe Bay with two persons on board. Seas were running at 30 to 35 feet and winds gusting to 70 knots. The anchor line soon snapped and the two men attempted to jog around the bay in the high winds. The vessel eventually capsized and sank. Crewman Paul Stratton (27) donned a survival suit but skipper Bill Wood did not. Stratton was able to reach a nearby beach where he was rescued three days later. Bill Wood was lost along with the Marmot Cape. Stratton paced the beach in search of food and his ship mate. When the rescue helicopter picked him up days later it was observed that bear tracks were interlaced with Stratton’s tracks up and down the beach*. MARTEN (1975) The 188 ton 82 foot wooden oil screw crab fishing vessel Marten struck a rock pinnacle, rolled over and foundered at 10:15 p.m. February 20, 1975 off of Spruce Cape, four miles north of the Kodiak Harbor. Captain Jeff Alexander (21) of Seattle was the only survivor of the disaster. Lost with the Marten were Jim Rich (21) of Seattle, Mike Rowe from England and Deere Alioski of Yugoslavia. Jeff Alexander was able to survive clinging to a cliff overnight in a snow storm. MARTHA (1924) The 23 ton wooden schooner Martha broke an anchor fluke in a heavy northwesterly storm and washed ashore on a reef on the E S E entrance to Catons Harbor at 6:00 a.m. April 27, 1924. The Martha had been towed to Catons Harbor and anchored by the schooner Louise. No one was able to get to the Martha in the northwesterly blizzard and snow storm before she washed up on the reef and was broken up by the seas. The Martha had 17 ½ tons of fish salt worth $112.75 aboard, which were lost along with the vessel which was valued at $1,000 at the time of the tragedy. Neither the Martha nor her cargo was insured. MARTHA (1939) The 30 ton 60 foot wooden oil screw fishing vessel Martha stranded and was lost at Walrus Island near Nelson Lagoon at 10:00 a.m. Thursday October 19, 1939. The vessel departed Unalaska October 14th bound for Bristol Bay with four crewmen aboard. The rudder was carried away in a storm causing the stranding. The four crewmen managed to escape but the Martha was a total loss. The vessel was valued at $7,500 of which $6,000 was insured. There was no cargo. MARTHA (1951) The 40 ton 60 foot wooden oil screw Martha burned August 16, 1951 at Nelson Lagoon. MARTHA W TUFT (1907) The 173 ton 105 foot wooden schooner Martha W Tuft stranded and was lost at the Katalla River during the night of October 5, 1907. A strong storm washed the vessel up onto the sand spit at the mouth of the river. The crew of seven was rescued from the rigging. MARTIE (1996) The 43 foot salmon seiner Martie sank August 2, 1996 at Evans Island in Prince William Sound. All five persons aboard made it to safety. MARTY N (1983) The fishing vessel Marty N caught fire while under way and was abandoned January 1, 1983 west of Glacier Island. The crew was rescued by the caretaker at the Fairmont Cannery who had heard the Mayday broadcast. MARY AND IDA (1904) The 110 foot wooden cod fishing schooner Mary and Ida drug anchor, stranded and was lost on Kelly’s Rock at Unga Island at 6:30 p.m. Tuesday February 23, 1904. The vessel was anchored just off the codfish station at Unga Island when the disaster occurred. A violent hurricane force storm with 90 mile an hour NW winds and rough seas stranded the Mary and Ida. She was carrying 78,000 fish or 200 tons of salted codfish valued at $12,000. The Mary and Ida was valued at $7,000 and became a total loss along with her cargo. The crew of 8 was helped to safety by the employees of the codfish station and all survived. The wrecked vessel was sold for $90 and stripped. The crew all survived the disaster, but the Mary Ann, valued at $5,000 and her cargo were lost. The vessel was insured for $2,500 and her cargo for $2,000. MARY ANNE (1986) The 34 foot fishing vessel Mary Anne was lost September 10, 1986 between Karluk and the Red River Lagoon. MARY ANNE (1992) On October 14, 1992 the 49 foot vessel New Star, the 29 foot fishing vessel Mary Ann and 32 foot vessel Silver Bullet were traveling together when the Mary Anne got line in her prop. The Silver Bullit took the Mary Anne in tow. While towing the Mary Anne into Mitrofania Bay the Silver Bullit struck a rock. The three vessels tied side by side to keep the Silver Bullit afloat. They then beached all three to make repairs when the tide went out. While the others slept, the owner of the Silver Bullit attempted to heat up his fiberglass hull to dry it out and make repairs. Unfortunately, the Silver Bullit was set on fire and all three burned. There was no loss of life. The Mary C Fisher was valued at $5,500 at the time of the tragedy. There was no insurance on the vessel or her cargo. MARY ELLEN (1890) The 77 ton Canadian schooner Mary Ellen was wrecked on a reef at Sand Point July 23, 1890. The wreck was sold for $150. The purchaser raised the Mary Ellen and sold her at a big advance to Jacobson of Victoria. MARY ELLEN (1942) The 18 ton 39 foot wooden gas screw fishing vessel Mary Ellen burned July 30, 1942 at Hinchinbrook Island. MARY G (1933) The 31 ton 51 foot wooden gas screw fishing vessel Mary G foundered in 1933 southwest of the Alaska Peninsula near the Shumagin Islands. There was no one aboard at the time of the disaster. MARY HELEN (1999) The 50 foot fiberglass codfish trawler Mary Helen was consumed by a stateroom fire and lost February 22, 1999 approximately 15 nautical miles southwest of King Cove. The master of the burning vessel was able to run her aground on outer Iliasik Island. Both crewmembers waded to shore, were picked up by the fishing vessel Melony Sue and transported to King Cove. MARY J (2002) The 65 foot aluminum oceanographic research vessel Mary J was lost October 10, 2002 on the rocks in Windy Bay near Chugach Passage. She had been under tow by the charter fishing vessel Shenandoah from Homer to Seward with no one aboard. The Shenandoah and the two persons aboard were never located. The Mary J was found washed up on the rocks in Windy Bay with a broken tow line still attached. She eventually broke up on the rocks. MARY L (1964) The 8 ton 31 foot wooden gas screw fishing vessel Mary L was reported lost at Kodiak in the Good Friday earthquake of March 27, 1964. MARY L (1989) The 38 foot fiberglass fishing vessel Mary L flooded her lazarette and sank October 25, 1989 in Chiniak Bay near Kodiak. Both crewmembers were rescued. Lost with the Mary Lee were her master Al de Hart and passenger Harry Balgrave. The Mary Lee was valued at $2,000 and was carrying camp supplies. MARY LOU (1991) The 66 foot fishing vessel Mary Lou grounded, was refloated, tied to a buoy in the channel and then sank July 16, 1991 near Dillingham. MARY PAT (1953) The 10 ton 27 foot wooden gas screw Mary Pat burned June 26, 1953 in Bristol Bay. MARY-RUBY (1964) The 119 ton 78 foot wooden oil screw fishing vessel Mary-Ruby was reported lost in the Good Friday earthquake of March 27, 1964 at Kodiak. MARY WOOD (1894) The schooner Mary Wood stranded and was lost near Kodiak January 18, 1894. The vessel was valued at $800 with cargo at the time of the disaster. The Maryland was valued at $4,000 and became a total loss with no insurance. The crew made it to safety. MARYLEE (1964) The 11 ton 29 foot wooden gas screw fishing vessel Marylee was destroyed by a tidal wave March 27, 1964 at Kodiak. MASSACRE BAY (1993) The 86 foot steel crab fishing vessel Massacre Bay grounded, capsized and sank January 16, 1993 at 02:30 in Alitak Bay. Matt Corriere (23) of Kodiak was the sole survivor of the crew of four. Lost were skipper Jock H Bevis (42), Tom Salisbury (48) and William Corbin (45), all from Kodiak. The Massacre Bay was later destroyed by divers using explosives to minimize environmental damage. MASTER CARL (1976) The 131 ton 72 foot steel crabber Master Carl overturned and sank in high seas and 90 knot winds on April 26, 1976 approximately 6 miles southeast of Cape Suckling near Kayak Island. Her four crewmen managed to escape to a life raft, but two perished when the small craft capsized in the surf near shore. Lost were Tom Miller of Cordova and Tom Davidson of Westport. MATTIE (1916) The steam mail launch Mattie was lost February 9, 1916 just north of Kodiak with all hands. The vessel departed the salmon hatchery at Litnik on Afognak Island with skipper John Pajoman (43 year old native of Pernan, Russia), Mr. Jesse Robins (U S Government employee manager of the hatchery), Mrs. John Orloff of Afognak and Miss Sarah Larsen of Larsen’s Island. All four were part of a wedding party. After a stop at Ouzinki village, the Mattie departed for the final leg of her journey around 5:00 p.m. A snow squall came up as the launch approached Mill Bay just north of the town of Kodiak. The contrary weather forced the vessel onto the rocks and all aboard were lost. MATTIE J (1962) The 14 ton 32 foot wooden gas screw fishing vessel Mattie J foundered October 1, 1962 off of the cannery dock at Chilkat. MAUREEN GREER (1971) The crab fishing vessel Maureen Greer foundered and sank February 28, 1971 at the entrance to Uganik Bay on Kodiak Island. All three crewmembers escaped injury. MAX (1958) The 8 ton 30 foot wooden gas screw fishing vessel Max was consumed by fire August 8, 1958 approximately 6 miles from Port San Juan. MAX (1980) The 95 foot trawler Max capsized March 15, 1980 off of Green Island in Prince William Sound. The captain of the vessel managed to beach her on Green Island. The crew of five was picked up by a U S Coast Guard helicopter. MAX (1991) The 91 foot longline fishing vessel Max capsized and sank May 14, 1991 near Hinchinbrook Entrance, Prince William Sound. All four crewmen were rescued. MAXINE (1965) The gas screw Maxine burned September 2, 1965 at Copper River Flats, southeast of Cordova. The Mayflower was valued at $325 and became a total loss. There is conflicting information on this wreck report making it possible for the Mayflower to have been lost in Chignik Bay on the mainland or in Chiniak Bay near Kodiak. Kalsin Reef in Chiniak Bay looks more logical. To further confuse the issue, the American Vessels Reported Lost During 1906 list has the same vessel lost October 24, 1905 at Solomon (near Nome). It is subsequently posted in H W McCurdy at the Solomon location. MAYO (1947) The 23 ton 43 foot wooden gas screw fishing vessel Mayo foundered August 20, 1947 one mile off Ninilchik Light. MEDINA (1967) The diesel screw Medina foundered February 6, 1967 a quarter mile off of Spruce Cape northeast of Kodiak. MELISSA RAE (1995) The 50 foot fiberglass cod trawler Melissa Rae iced up, rolled over and sank March 17, 1995 about 45 miles from King Cove near Cold Bay. The vessel was returning from a two day fishing trip near Sanak. All four persons aboard made it to safety. MELODY (1964) The 9 ton 31 foot wooden oil screw fishing vessel Melody was destroyed by a tidal wave March 27, 1964 at Seward. MELODY (1989) The fishing vessel Melody capsized and was lost May 11, 1989 near Homer. MEMORIES (1963) The 13 ton 35 foot wooden gas screw fishing vessel Memories was consumed by fire September 21, 1963 at Cordova. MENLO (1971) According to the List of Merchant Vessels of the U S (1974), the 23 ton 47 foot wooden oil screw fishing vessel Menlo was lost during June of 1971 after a collision with an unknown object 45 miles southeast of Juneau. Newspaper articles from the period report the vessel as lost April 24, 1971 “near Portlock Bank”, “off of the south end of the Kenai Peninsula” and “near Seldovia”. Three people were lost with the Menlo including Jack Cremin, his son and Hal Painter. The Cremens were living in Anchorage but all three of those on board were from Port Orchard, Washington. The vessel departed Seattle April 14, 1971 bound for the Gulf of Alaska. MERCURY (1900) The 1050 ton 193 foot wooden ship Mercury sprung a leak and was beached on Unimak Island at 12 noon August 12, 1900. The vessel departed Nome August 3rd with seven crewmen and no cargo aboard. They were bound for Seattle. The crew escaped to safety, but the Mercury was a total loss. MERCURY (1958) The 73 ton 72 foot wooden oil screw fishing vessel Mercury burned June 26, 1958 at Seldovia. MERCURY (2001) The 60 foot tug Mercury flooded and was abandoned September 5, 2001 approximately 26 miles southwest of the Ugashik River in Bristol Bay. The two crewmen aboard were rescued by U S C G Helicopter and taken to King Salmon. The Mercury had been towing a crane barge when heavy seas began flooding the tug. The barge was cut loose and tug abandoned. Salvage efforts for both vessels were under consideration. MERIDIAN (2002) The 52 foot fishing vessel Meridian flooded her engine room and sank January 18, 2002 approximately 14 miles north of Kodiak in Marmot Bay. All three crewmembers were rescued by the fishing vessel Carlsen Point. MERIT (1998) The 32 foot salmon gillnet fishing vessel Merit was consumed by fire and lost May 28, 1998 near Port Nellie Juan in Prince William Sound. Both crewmembers made it to safety. MERKA (1961) The 8 ton 34 foot wooden gas screw fishing vessel Merka was destroyed by fire August 23, 1961 at Controller Bay. MERMAID (1913) The launch Mermaid was lost in Valdez Narrows January 24, 1913 with two aboard. Charles Rua, owner of the mine at Rua Bay on Knight Island was lost. Charles Lindquist was rescued by Natives in a bidarka. MERMAID (1964) The 24 ton 41 foot wooden oil screw fishing vessel Mermaid burned May 23, 1964 at Kodiak. MEROM (1900) The 1,158 ton 179 foot wooden bark Merom stranded and was lost in the Karluk Harbor at 3 p.m. Saturday October 6, 1900. The vessel departed San Francisco August 29, 1900 bound for Karluk with 16 crewmen. One crewman, 34 year old William Booke from Germany was lost in the stranding. The Merom had 500 tons of cargo including 12,574 cases of canned salmon worth $50,000 on board at the time of the disaster. The Merom, valued at $14,000, and her cargo were listed as total losses. The vessel was owned by Alaska Packers Association of San Francisco and had no insurance. A Peterson, master of the Merom, attributed the losses to a “severe storm”. Conditions at the time were listed as a strong gale, clear weather and high seas. Source: U S Customs Wreck Report November 7, 1900 by Peterson in San Francisco. METEOR (1953) The 8 ton 28 foot wooden gas screw fishing vessel Meteor was consumed by fire November 7, 1953 off of Rocky Point on Montague Island in Prince William Sound. METEOR (1963) The 83 ton 75 foot wooden oil screw Meteor stranded and was lost August 1, 1963 at Coal Harbor, Zacher (Zachary) Bay, Unga Island. METEOR (1978) The 30 foot fishing vessel Meteor burned and sank in Whale Pass July 1, 1978. The same vessel hit a snag and tore a hole in her bottom a week earlier near Long Island. MIA DAWN (1984) The seiner Mia Dawn grounded and sank in bad weather February 25, 1984 at Tolstoi Point, Unga Island. The Miami was valued at $10,000 at the time of the loss. The damage to the vessel was reported as $10,000. She was not carrying cargo. The crew made it to safety. MICHAEL LEE (1980) The 93 foot fishing vessel Michael Lee foundered and sank June 14, 1980 near Clarks Point in Nushagak Bay. Four of the five crewmembers on board were rescued by the Soviet processing ship Soyuz V. Cory Kaldestad (62) of Seattle, skipper of the Michael Lee, was lost. MICHELLINDA (1983) The fishing vessel Michellinda burned and became a total loss August 28, 1983 outside of Whittier. MIDNIGHT SUN (1989) The 38 foot wooden salmon fishing vessel Midnight Sun sank due to overloading and insecure hatches July 22, 1989 in Cook Inlet. All four crewmembers made it to safety. MIDNIGHT SUN (2011) The 68 foot fishing vessel Midnight Sun stranded and was lost February 10, 2011 at Cape Paramanof on the west side of Afognak Island. All five crewmembers were rescued by U S Coast Guard Helicopter CG6007. MIKI MIKI (1989) The 126 foot wooden fishing vessel Miki Miki flooded and was abandoned January 6, 1989 ten miles off of the Kenai Peninsula. The vessel was being transported from the Cook Inlet to Seward when she started taking on water. The crew alerted the U.S. Coast Guard that they were taking on water in the heavy weather. Helicopters arrived on scene and were monitoring their travel when the vessel began losing the battle with her pumps. Winds were at 70 mph and seas to 25 feet when the Coast Guard helicopters plucked the crew from the Miki Miki as it traveled slowly to the northwest. She was presumed to have sunk. The rescued crewmembers were identified as Gregory Holta, Mike Holta, Randy Madison and Bjorn Nagel. MILLIE M (1974) The 27 foot vessel Millie M burned and sank July 16, 1974 near Kodiak. MILLIE S (1964) The 21 ton 43 foot wooden oil screw passenger vessel Millie S was destroyed by a tidal wave March 27, 1964 at Seward. The crew of the Minneapolis had 12 tons or 200 bbls. of herring aboard and a seine on deck when the disaster occurred. They all managed to get to safety, but the vessel and her cargo were lost. The value of the Minneapolis was $2,500 and her cargo $5,000. There was no insurance. MINNIE S (1964) The 17 ton 38 foot wooden oil screw fishing vessel Minnie S foundered July 12, 1964 northwest of Green Island in Prince William Sound. MINOTAUR (1993) The 32 foot longline fishing vessel Minotaur flooded and sank September 9, 1993 near the entrance to Prince William Sound. Both crewmembers were rescued by the fishing vessel Dr Jack. MIRANDA ROSE (1995) The 42 foot fiberglass salmon seiner Miranda Rose collided with the fishing vessel Primus and sank July 27, 1995 west of Rocky Point in the Shelikof Strait. All four crewmembers made it to safety. MISERABLE SKUNK (1982) The 19 foot cabin cruiser Miserable Skunk capsized while pulling a crab pot July 3, 1982 five miles east of Homer in Kachemak Bay. Grant Chapel (74) of Apache, Arizona and Martha E Hall (74) of Eagle River were lost in the disaster. Hall was the owner of the vessel. MISS ALASKA (1974) The 197 ton oil screw Miss Alaska foundered June 23, 1974 off of Kodiak Island. The entire crew was rescued by a U S Coast Guard helicopter. MISS ANNGEL (1992) The 65 foot trawler Miss Anngel sank October 14, 1992 approximately 70 miles southwest of Kodiak Island. The vessel took a series of waves that flooded and sank her. Her three crewmembers were rescued. MISS ARCTIC (1964) The 31 ton 44 foot wooden oil screw fishing vessel Miss Arctic was reported lost at Kodiak in the Good Friday earthquake of March 27, 1964. MISS BELLE (1978) The double ended fishing vessel Miss Belle was hit broadside by a huge wave, capsized and sank May 2, 1978 on the west side of Cape Suckling. The double ender had blown her engine and drifted for three days with two crewmembers on board. The fishing vessel Pacific Sea found the Miss Belle and was towing her to safety when the disaster occurred. Both crewmembers were rescued by the Pacific Sea. The Fish and Wildlife Patrol Vessel Enforcer brought the two men back to Cordova. MISS BRENDA (1982) The 38 foot fishing vessel Miss Brenda sank December 7, 1982 in Duck Bay on Afognak Island. The eight persons aboard were picked up by the fishing vessel Ruff & Reddy. MISS CARROLL (2007) The 50 foot fishing vessel Miss Carroll was consumed by fire and sank July 16, 2007 40 nautical miles east of Cape Resurrection. Heavy smoke was discovered by the four crewmembers at 3 a.m. requiring an immediate abandonment of the vessel to her seine skiff. A hand held radio was used to issue a May-Day. The fishing vessel Barwell responded, rescued the crew of the Miss Carroll and transported them to Seward. It was the belief of crewmen aboard the lost vessel that the fire originated in the area aft of the main engine where the cabin stove pump was located. Storm Chasers arrived on scene and concluded that the Miss Carroll had gone to the bottom. They were only able to retrieve the lost vessel’s seine. MISS D (1946) The 23 ton 50 foot wooden oil screw fishing vessel Miss D was consumed by fire at Anchorage June 28, 1946. MISS IN SOO (1988) The 85 foot fishing vessel Miss In Soo disappeared and was presumed sunk November 30, 1988. The vessel was abandoned by her crew of four approximately three miles south southwest of Narrow Cape. The crew was picked up by the fishing vessel Kristine Alaska. MISS MARI (1997) The 28 foot longline fishing vessel Miss Mari flooded from the stern and foundered July 20, 1997 southwest of Elrington Island in Prince William Sound. The only person on board was rescued by the fishing vessel Coho II. MISS UNIVERSE (1987) The 85 foot fishing vessel Miss Universe was lost June 16, 1987 on a trip from Chignik Lagoon to Alitak Bay. A Coast Guard search spotted her submerged pilothouse in the Semidi Islands and two days later her beached raft. There were no survivors. Lost with the Miss Universe were Howard Broadway of Kodiak, Karen Spector of Madison WI and Leonard Gridley. MIST (1963) The 20 ton 41 foot wooden oil screw fishing vessel Mist foundered March 15, 1963 off of Spruce Island near Kodiak. MISTY (1981) The 86 foot trawler Misty caught fire and sank September 7, 1981 in Marmot Bay while dragging for scallops. The five crewmen aboard were picked up by the fishing vessel Trailblazer. MIZPAH (1910) The 64 ton 70 foot gas powered schooner Mizpah caught fire and burned after an explosion aboard May 25, 1910 at Kvichak. The schooner had been converted to gas power in 1902. MOJO (1975) The 26 foot vessel Mojo sank August 10, 1975 in Ugak Bay. All on board were picked up by the fishing vessel Mariner. The crew survived the disaster, but the Monroe, valued at $10,000 was a total loss as was her cargo. MONSTER (1992) The 32 foot fishing vessel Monster was consumed by fire and sank June 23, 1992 at the mouth of the Egegik River. All crewmembers made it to safety. The wreck report goes on to report that there was no loss of life. The Montana was valued at $12,000 and was a total loss. It was not known at the time how much of the cargo was lost. MONTCLAIR (1972) The 7 ton 28 foot wooden gas screw fishing vessel Montclair was consumed by fire July 20, 1972 at Kvichak. MOON (1964) The 8 ton 30 foot wooden gas screw fishing vessel Moon was destroyed by a tidal wave March 27, 1964 at Seward. MOON SONG (1985) The 50 foot seiner Moon Song sank April 27, 1985 off of Cape Chiniak near Kodiak. All six persons aboard were rescued. MORENGEN (1922) The 25 ton gas screw fishing vessel Morengen was lost with all hands November of 1922 between Cape Spencer and Yakutat. The vessel departed Sitka October 19, 1922 bound for the Yakutat fishing banks with 6 crewmen aboard. The Morengen had about 9 tons of ice and bait aboard when she left port. She was last seen by the gas boat Caroline steering eastward of Yakutat. Lost with the Morengen were master Hans Walderhaug of Petersburg, Jack Refenes, Carl Hagan, Charley Peterson, Olaf Vallum and one other. No wreckage was found. The Morengen was valued at $6,000 and had no insurance. MORNING STAR (1989) The 42 foot fishing vessel Morning Star capsized and sank January 14, 1989 in Uyak Bay. Owner, Francisco (Frank) Beeman (50) of Kodiak, was lost. The second crewman, Joe Talien survived. MORNING STAR (1992) The 34 foot salmon seiner Morning Star ran up on the rocks and sank February 23, 1992 at Seldovia Point. Ricky Maerz (37) from Homer was lost. MOUNT MCKINLEY (1942) The 4,861 ton 360 foot steam ship Mount McKinley stranded and was lost off of Scotch Cap beach March 11, 1942. She had been following a zigzag course during a submarine alert when the disaster occurred. All passengers and crew were removed before the vessel broke up in spring storms. MOUNT MCKINLEY (1965) The 39 ton 60 foot wooden barge Mount McKinley foundered in May of 1965 off of Seldovia. MR GEORGE (1973) The 13 ton oil screw Mr. George stranded and was lost July 20, 1973 at Cook Inlet. MS ARIES (1990) The 42 foot salmon seiner Ms Aries sank in September of 1990 on a trip from Chignik to Kodiak. All persons aboard were rescued. MS B HAVEN (1982) The fishing vessel Ms B Haven sank January 1, 1982 in Prince of Wales Passage. MS FORTUNE (1996) The 38 foot fishing vessel MS Fortune was consumed by fire and lost July 16, 1996 at Cape Seniavin in the Bering Sea. MURRE (1958) The 7 ton 29 foot wooden gas screw fishing vessel Murre burned December 30, 1958 at Cordova. MUTUAL (1992) The 85 foot longline fishing vessel Mutual was consumed by fire and sank July 25, 1992 approximately 40 nautical miles southeast of Seward. Both persons aboard were rescued. MYRA (1948) The 10 ton 39 foot wooden oil screw Myra burned in August of 1948 in the harbor at Whittier. MYRA JEAN (2003) The 42 foot Pollack trawler Myra Jean struck a rock, capsized and sank February 18, 2003 at the head of Wells Bay, Prince William Sound. The vessel was engaged in pot fishing for shrimp. Both crewmembers were rescued by the fishing vessel Anna Lee. Pollution mitigation was undertaken and salvage was under consideration. The Myrtle had a value of $3,000 at the time of the loss. Much of the cargo was salvaged. There was no insurance. MYSTIC LADY (1994) The 40 foot fishing vessel Mystic Lady burned to the waterline September 9, 1994 in Kitoi Bay near Kodiak. The fire originated from a stove. No one was aboard at the time of the blaze.